Look at what Nathan did. We were not pleased. 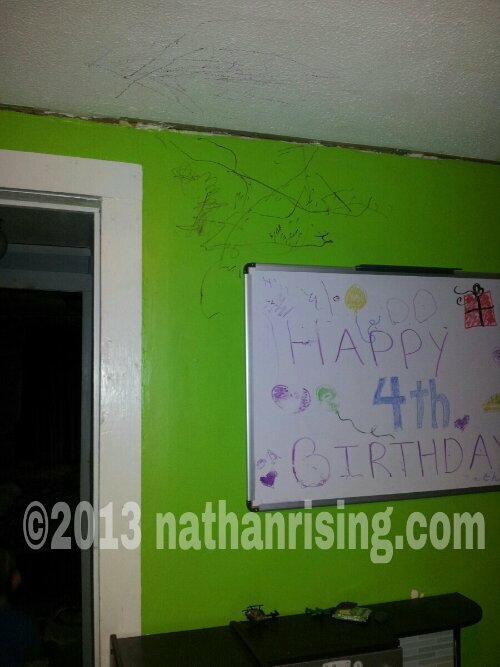 He shimmied right up onto the top of his kitchen (shown in very bottom of picture), grabbed the marker off the ledge at the TOP of the dry-erase board, and proceeded to color all over the top of the wall and the CEILING. Yes, he colored on the ceiling. It’s one of those things that we can’t for the life of us figure out why the heck he’d do something like that. He knows better! He got into a lot of trouble for that. I tried explaining to him that not only is it wrong to deface property, but he seriously could have gotten hurt if he’d fallen off his play kitchen. I really thought by now he’d be past a lot of these antics. But nope. He’s still doing things like this. And also doing stuff like squirting half the tube of toothpaste into the toilet. And speaking of toilets, he’d also put an entire roll of toilet paper in the toilet. (At least it was still a roll of toilet paper… easier to get it out!) He definitely still likes to get into stuff. Also, I’m sure you notice the board still says happy 4th birthday to Nathan. He turned four in February, and the night of his birthday, we snuck into his room while he was sound asleep and left him a surprise birthday message. He loved it! In fact, he loved it so much that he didn’t want us to erase it, even three months later. And I guess he loved it so much that scribbling all over the wall and ceiling was preferable to scribbling all over that dry erase board. This entry was posted by Jen on June 23, 2013 at 3:11 pm, and is filed under Oh the things Nathan does. Follow any responses to this post through RSS 2.0.You can skip to the end and leave a response. Pinging is currently not allowed.